We are incredibly proud to announce that three Hodder titles have been shortlisted for this year’s Arthur C. Clarke Award. As the shortlist is only six books, that’s a pretty good showing! Obviously we’re pretty biased, but we’re thrilled to have such a brilliant sample of our SFF publishing making up half (eee!) of the Clarke Award shortlist! 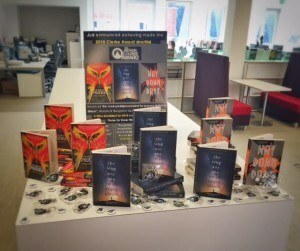 Each book is exceptional, and each is very different from the others: one is a fantastically dark YA novel, one a life-affirming romp through deep space, and one a incendiary exploration of the far future. The shortlist as a whole is a superb cross-section of modern science fiction, with something for everyone, and we simply couldn’t be prouder to be publishing three (three!) of the shortlisted titles. 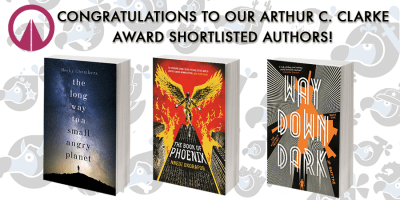 Speaking on behalf of everyone here at Hodder, I’m hugely proud to see these extraordinary books on the shortlist, and delighted to offer Becky, Nnedi and James – and everyone else – our most jumpy-out-of-our-seats-and-cheer congratulations. The full shortlist and the official press release can be found here. Congrats to all the shortlisted authors and publishers – we’ll see you in August!